Can you guys bring back the highlighting of a user's own thread? It's really useful to be able to immediately spot your own threads in a sea of other threads. please give the option for a Light/Dark Legacy functionality to thread titles and page numbers. I like to click on a topic title and see the OP always. I also want thread numbers back at all costs, even if my Legacy request goes unanswered, MobileERA is a bastardized version of the forum at this point without thread numbers. What do you mean by page numbers, exactly? I don’t love how it is currently, but you can jump to any page on mobile by tapping the “x of y” page number and typing the page you want. EDIT: Oh, wait, thread view. Yeah, sorry, I agree with you. This is actually one of the few posters I have interactions with outside of Era and, while I can't speak for what they say in their PMs, based on my interactions with them that ban was definitely not something I expected. I recall them posting some criticism during the whole Entertainment matter that they thought they might catch a ban for (they didn't), but it seems those threads are gone, so I can't judge how similar their tone was then to this post. I'll echo this sentiment. e: FyreWulff. I know him a little outside of GAF/ERA and he has always been pleasant and reasonable. Is Resetera keeping anyone else's android screen awake? I'm sure it's triggering something in Edge and Chrome on Android, a media playing flag or something. Thank you for adding a way to disable avatars on the thread list. 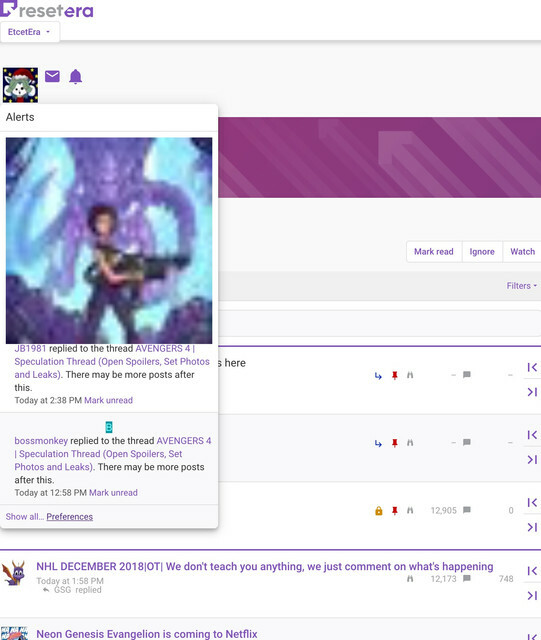 Is it possible to implement the old feature where I can hide all avatars and images? I'm on Safari Mac and the sidebar on the left side re-opens after I navigate to a new page. I'm sure it's been reported but it's super annoying. Other than that, I'm liking the redesign! Is there a way to save your toggle width and sidebar preferences? I'm finding it rather cumbersome that I have to re-toggle it every time I close a session. So are watched threads going to be fixed any time soon? When on mobile with avatars disabled on the thread page, there is no discernible left margin. The text starts right at the left edge of the screen and it is awkward. There is a right margin after the |< and >| buttons. The lack of a reload button and the lack of direct navigation to the sections and watched are my main issues now on mobile. Also the watched page looks kind of strange at the top. Please fix the era home screen shortcut for iPhones. It loads into a broken and logged out safari page. Board's been running a lot better today. Threads from hangouts aren't appearing in my watched threads. When I click on this thread, it is still taking me to page 7 by default every time. [ Cross] tag is still broken. This < word has the tag applied to it but it isn't being hidden. The forum can get mad laggy at times. I really think this new upgrade is a bit too unoptimized. Came to post same thing. On mobile chrome. Very sluggish. Make sure you click on "Staff Posts" in the top of this thread. There's one that lists a workaround for the watched threads issue. I haven't looked through the entirety of this thread, so not sure if mentioned, but is anyone else having issues with the way the new site looks on iPad? Particularly on Safari and Grazing? The mobile site running on my iPhone (iOS 12.0) looks terrific otherwise. It would be awesome if the same type of formatting can be carried over to iPad as well. The staff tag is still broken w/ things like styling, newlines and colors producing raw HTML. Not gonna celebrate just yet but the sidebars seeming to remember I want it closed on reloads/page loads! Sites running alot smoother to. Some big kinks seem ta have been worked out. Prolly by next week all the fussing'll be solely about design stuff instead of fixing the site itself. This is why patience is key! Much improved over last few days. Removed thread avatars. Text now way too close to left edge of screen. Google pixel 2. Android. Some threads I am watching are no longer in my watch list. If I unwatch and rewatch them, nothing changes. You may want to Ctrl+F this page for "watched threads". It hasn't even been an hour since the temporary workaround was reposted for at least the third time today. Is there a way to not have mouseovers on usernames and thread titles? It is something delta or I will work on fixing tonight as soon as we have the chance. I’ll discuss with the others if we want to keep this or not. We're aware of this issue, and we're hoping to fix it soon. The width toggle is not persistent across pages. If I open a new tab or page or come back later, I have to toggle width for each individually. Can we make this a settings option? Not really a bug, but why the hell is order by "relevance" the default search mode? Do I really have to always use advanced search to sort results by date? On the desktop version if your mouse stops on a twitter post or even an advert your mouse scroll wheel becomes unresponsive. Seems weird, might be expected behavior might not. Are you all working on an option to hide all avatars? This may have already been asked and answered, and if so I apologize. I can't see anything but the Twitter logo when someone posts a tweet in a thread. And there's nothing to click on to take me to twitter to see it there. Is that something just because I'm viewing it on a phone, or another issue? Going back to the previous page on mobile is so juddery, loading the massive banner or bazillion different menu elements, I think every which way is struggling. Nothing feels smooth. I don't want to complain too much, early days and hard work but the previous site version was godly even if it lacked some features, can you not streamline it down to something similar based on the new framework so navigating and posting is fast and smooth as butter. I'm not loving this at all. A bug I noticed is if I post a comment then refresh the page, my post is also in the compose box for some reason. Just wanted post update on scrolling performance. It's getting better after the changes being made. Hopefully we can get to the point where it's as fast as the old site. I wonder if some of the performance problems on mobile are related to SVG graphics. Speaking of the search bar, while searches are functioning for me, it's no longer displaying results by most recent date. This was really crucial for me in the past design and I'd really rather not sort through threads that are no longer relevant from months ago. Hopefully it can be fixed. I can't see the Gaming forum at all when I am logged in. It reappears when I log out, and disappears again when I log in. This happens on both my computer (Firefox) and my phone (Chrome browser). The width toggle isn't holding, as others have mentioned. Is that a per-platform thing? Is it reverting to the narrow width because I looked at the site on my phone and then went back to PC? I'm not sure if this is a bug or just a nitpick, but when I open a thread in a new tab and then switch to it, I can see the entire thread laid out on screen, then the screen goes blank and the page plays back the "loading" animation where it draws in each reply one at a time. That's cool and all, but there's too much of a delay, and it wipes the screen after I've already started reading the OP. If the loading screen is mandatory, have it play out in the background, or leave the page blank until I look at it. It's kind of annoying to see it actually erase the screen and then redraw it just so it can play its fancy animation. Or, give us the option to remove the animation. Did you accidently ignore the forum? Check your settings. That was it! No idea how that happened. Thanks! There's no longer a refresh button on the right-hand side of the screen. It made it really easy to refresh and was a nice feature. Favicon disappeared from my bookmarks page after the migration. Just a generic “R” in Apple’s don’t now. Why is there not a tick box to mark off threads as read/to ignore (just like in watched threads). Having to enter a thread just to ignore it seems really backwards. If ignoring a thread required the tick box, you'd also elimate those weird cases where people ignore the entire forum. On desktop browsers (both Firefox and Chrome), there is this weird "fade in from the top" effect that happens 2-3 seconds after the page has loaded, if it's your first time viewing a thread (or indeed, a forum index - but those are quickly all viewed and it doesn't happen a 2nd time). This is quite distracting, please remove at least from new threads.